The developers at Yahoo Labs have just released their latest experiment in keeping education entertaining--a simple game of adversarial economics dressed up as a zombie apocalypse. 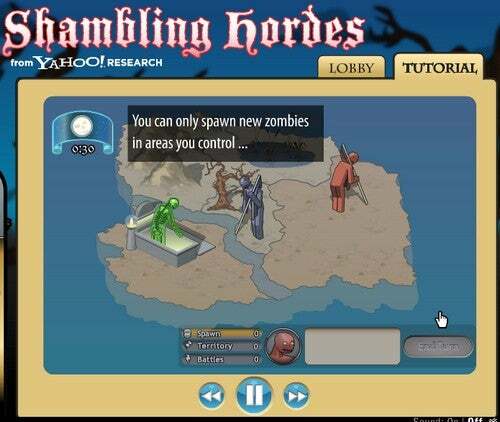 Shambling Hordes is a simple game of territory control that challenges players to assume the mantle of "Zombie Warlord" and conquer a desolate island with a limited supply of undead legions. Each warlord must demolish the opponent's crypt while protecting their own, conquering territory along the way. Holding more territories has a direct mathematical correlation to the number of zombie legions a player may spawn each turn, and multiple legions may be stacked in a territory to improve their odds of survival when the inevitable undead scuffle breaks out. The thin skin of a zombie apocalypse is stretched ghoulishly tight across a skeleton of simple economics, as the odds of success are made plain at the beginning of every battle with a straightforward numerical breakdown of each player's zombie horde. Each battle is divided into a series of skirmishes, with each player secretly dividing their horde into three groups before the opposing groups engage in cartoonish battle. Naturally he who has the most zombies wins, and whoever wins two of the three skirmishes claims the territory before shambling on.